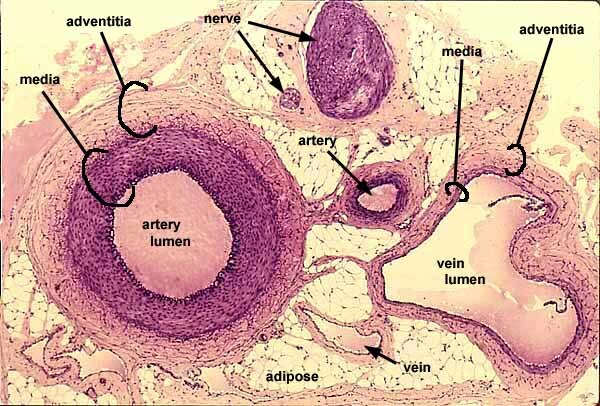 Peripheral arteries, veins, and nerves tend to travel and branch in parallel. Wherever one of these structures is found, the other two are likely to be closeby. In this specimen, elastic tissue is colored dark purple, cytoplasm (in smooth muscle and nerve) is lighter purple, and collagen is pale pink. The background is adipose connective tissue. Note differences between artery and vein, most notably the thickness of the vessel wall relative to the lumen. The intima is not noticable at this magnification (although intimal flaps of a valve are visible in the large vein). The media is the thickest, most conspicuous layer of the artery, much less pronounced in the vein. In this loose connective tissue, the adventitia comprises distinct layer. For an enlarged view of the arterial wall, click on the thumbnail at left.